A general whine about the lack of Wi-Fi and a look at alternatives. Despite being at the UK launch - and distinctly remembering the words, "Wi-Fi drivers will be made available on our website" coming directly from the mouth of one of their fibbing representatives - no drivers ever materialised for the Treo 650 during the six long months I waited. Eventually, I reluctantly jumped ship to the dark side of Windows Mobile, where Wi-Fi is usually either built in or a mere Wi-Fi enabled SD card away. I didn't particularly like the look of any of the available smartphones, but in the end plumped for an i-mate JAM Windows smartphone and a Sandisk Wi-Fi 256MB SD card. Although I was now fully Wi-Fi'd up, in reality I rarely used the phone for wireless browsing as the display was too small to be practical for a lot of web surfing. Although the lack of Wi-Fi remains a major disappointment on the Treo (it's also noticeably absent from the latest Treo 700p, much to the consternation of their loyal user base), T-Mobile's superb unlimited data Web'n'Walk deal ably makes up for it, offering unlimited GPRS data for just £7.50 a month. Although I love the speed of Wi-Fi on the move, it's not a great deal of use when you're out in the wilds and miles from a hotspot. If you do manage to locate a connection, more often than not someone will be demanding a connection fee - and is there really that much benefit to be had from broadband speeds when you're looking at a squinty little phone screen? Moreover, I invariably end up switching to text-only browsing when I'm accessing sites on the move as it's generally information I want when I'm out and about, not pretty pictures. The Treo does come with the faster EDGE technology, which offers an impressively nippy maximum data transfer rate of 384 kbp, but it's a bit of a non starter for UK users as the last time we looked only Orange were offering the service. 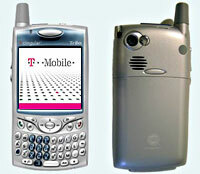 Although onboard Wi-Fi appears to remains a distant dream for the Treo there is at least the option to use the Enfora Wi-Fi sled. It's not the most elegant solution by any means, but good enough if you're desperate for Wi-Fi, and the standalone form factor at least means your batteries won't drain as quickly as phones with built in Wi-Fi. 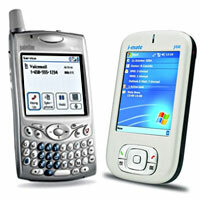 Another factor that helped nudge us into the world of Windows Mobile was the lack of Skype support for the Palm. Despite endless pleas from the sizeable Palm community, Skype haven't shown the slightest interest in developing a Palm version yet, and continue to remain tight lipped about any possible future plans. To be honest, we found the Pocket PC version something of a disappointment and only used it very occassionally with very mixed results, but we can see the lack of Skype support continuing to lose some customers for Palm. There is, however, a way to access Skype on a Palm via a service called EQC, but it's a convoluted process which involves running a Java app on your phone and then installing a plug-in on your desktop PC. Although we haven't tested it yet, Treo owners can try a new alternative VoIP service called mobiVoIP, although this needs "a stable internet connection with good QoS (Quality of Service). Wifi, Bluetooth and EvDO (Rev A) provide that quality" - so, in other words, you can forget all about using it on your standard phone connection. There is a third option available for ultra keen dabblers who like to tinker about, and this involves using the iSkoot mobile software and a not-inconsiderable amount of fiddling about, as detailed here. In my final installment, I'll explain how the Treo has replaced my laptop for short trips and look to the future of the smartphone.